A good night’s sleep is truly priceless, and no one knows that more than those of us who often have trouble sleeping. There are a bunch of different things people try in order to sleep better at night, but something you might not realize is that your pillow can have a big impact on the quality of sleep you get. 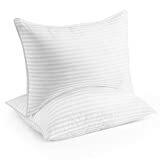 Check out the Beckham Hotel Collection Gel Pillow, which is available on Amazon right now in 2-packs for just $30. They’re wonderfully plush and they have more than 2,200 5-star reviews, which explains why they’ve also been awarded a coveted “Amazon’s Choice” designation.